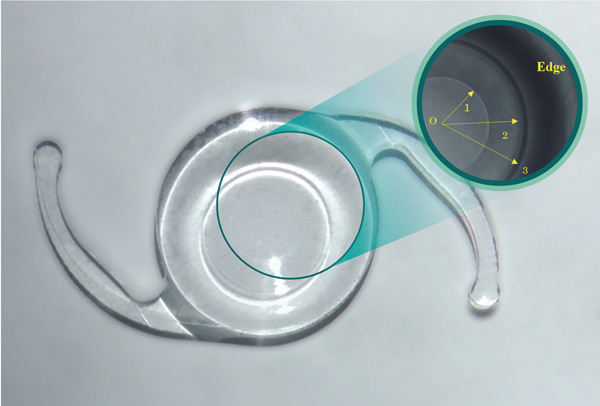 To regain a continuous range of clear vision for pseudophakic presbyopia, the research group of Yongji Liu from Nankai University proposed a double-zone aspheric diffractive IOL with an extended depth of focus (DOF) of 1.5 D. The modulation transfer function at 50 cycle/mm remained above 0.29 within ± 5° field of view for object distance ranging from 6 m to 0.66 m in photopic vision. In addition, the imaging qualities are robust for pupil changes, different corneal asphericities and polychromatic light, which makes it valuable for real clinical application. The designed IOL was manufactured and the optical performance was evaluated in a continuous range of object distance. The manufactured IOL exhibits the ability to extend DOF. This work has been published in Chinese Optics Letters, Volume 16, No. 9, 2018 (Yayan Bian et al., Design of double-zone aspheric diffractive intraocular lens with extended depth of focus). "The goal for presbyopia correction is to obtain a continuous clear vision as younger eyes do." says the corresponding author Yongji Liu, "The proposed IOL gives a new possible way to achieve this ultimate goal."